STEP Residential™ is a 12" (30cm) wide radiant heating element designed to provide healthy, even and comfortable warmth in a home. This heating element is ideal for both new construction and renovation. STEP Residential™ heating systems can be used to heat floors, support existing heating systems, or as the primary heat source. 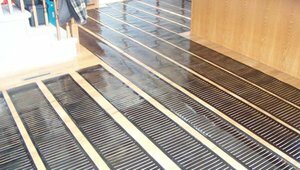 The radiant heating element can be installed under most floor coverings, including: tile, stone, hardwood, engineered wood, laminate and carpet. Heating bathroom floors or larger areas of the home will not only increase the comfort and improve indoor air quality, but will also reduce the energy usage. The self-regulating properties of the flat 12" wide heating element makes the heating solution extremely energy efficient compared to other heating sources. Eliminate the chill of cold floors and experience the comfort of heated floors in the bathroom, kitchen or whole house. For even heat distribution, maintain spacing between element strips at 2-3 inches (5-7.5 cm).